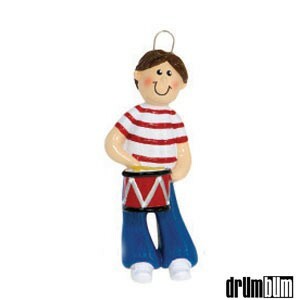 Boy Drummer Ornament – Add some extra Christmas spirit to your tree with a cute, Boy Drummer Ornament! Wonderfully decorated with colorful paint, this Christmas tree ornament is sure to complete any drummer’s holiday. The ornament depicts a smiling boy with a red and white striped shirt holding his drum, ready to play. This music ornament is perfect for the Christmas holiday season. Made from resin. Approx. 3.25″ L.
Awesome Christmas Drummer Ornaments at DRUM BUM!